Having met a number of clients in the last few weeks it is interesting to observe that views are fairly consensual – significant bearishness on bonds (so significant as to encourage a contrarian to be long bonds?? ), nervousness about equities (although fully invested due to lack of many better opportunities) and wholesale bullishness for ‘uncorrelated’ assets particularly those which are infrastructure related. This bullishness is reflected in significant demand for shares playing to this theme. For example, HICL Infrastructure recently raised £268 million (m), in excess of the £205m they were seeking, a reflection of how ‘materially oversubscribed’ it was. This was in addition to the £260m raised in March, an issue which was ‘very significantly oversubscribed’ and the £113m raised in September 2016 which was also ‘materially oversubscribed’. HICL’s popularity is not unique. John Laing Infrastructure Fund raised £120m in March (‘oversubscribed’), BBGI raised £59m in March (‘significantly oversubscribed’) and International Public Partnership raised £330m (£70m of subscriptions) late last year. Consequently, the PPP/Infrastructure Sector within the Investment Companies market has a market capitalisation of over £9 billion (bn). All the shares trade significantly above net asset value (NAV). Not to be outdone, each of the six largest investment companies offering exposure to renewables (wind, solar etc) has raised money since last summer and that subsector now has a market capitalisation of almost £4bn. Once again all the shares stand at premiums to NAV. The dividend yields of the 10 companies mentioned range from 4% to over 6% and with many revenues claimed to be government backed and index-linked, the attractions are obvious. I have no insight whatsoever to offer on these industries, but, the history of popular, highly rated, ‘alternative’ investment companies is not propitious. It will be interesting to see if this record can be broken. Investors often complain about short-termism, the implication being that if we could act in the long-term, the job of a fund manager would be much easier. SuperInvestor Insight recently highlighted a Morningstar article from January 2008 in which an analyst named five stocks to own for a decade. He focused on two necessary qualities, a ‘wide or narrow moat that should remain intact – if not widen – through 2018. Second, transient negative news has driven their share prices into negative territory.’ The analyst picked McGraw-Hill, Cemex, Amgen, Western Union and Legg Mason …and with six months to go is apparently level with the S&P 500 with two big winners and three big losers. Obviously this one random anecdote proves absolutely nothing, but I assume the author would be surprised and/or disappointed to find he did not outperform. Most of us would argue that very short- term investing is equivalent to a trip to the casino. Is very long-term investing any better? Dividends – too much of a good thing? Boards typically like to increase dividends. If a company is doing well it is a clear sign of optimism for the future and if a company is struggling it can be used as, well, a clear sign of optimism for the future. In a world where advisors are no doubt informing boards that high yields are particularly attractive to investors, it is interesting to see pay-outs increasing. Of course, it is typical to applaud such behaviour, but it does make one wonder if dividends are being given significant priority over capital expenditure at the cost of longer-term growth in profits and also whether in general dividends will be particularly sensitive to a reversal in earnings. Capitulation – a positive sign for value investors? Mr Grantham’s arguments are interesting and he is a dangerous fellow to bet against. 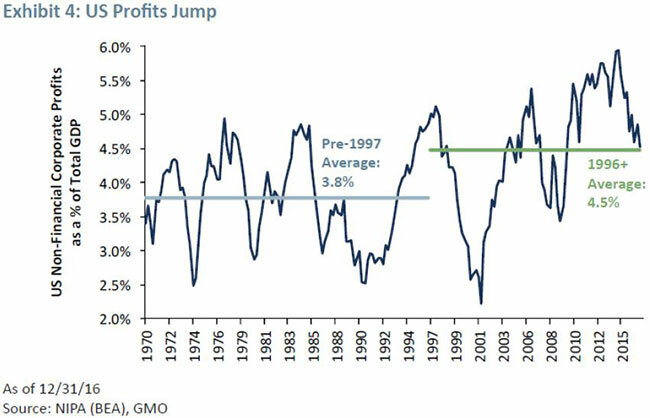 However, one of his charts caught my eye and made me wonder if he could have just as easily used it to argue that profit margins are already falling and could quite easily return to a multi-decade average. All rights reserved. Issued by Investec Asset Management, issued May 2017.